Choose from a number of standard post and panel bracket accessories or have us make a custom design that meets your specific wood post and panel sign requirements. All of our 4X6 and 4X4 post and panel bracket accessories are finished in a powder coated textured black finish. Signage helps bring customers to your business. That's a well-known fact. What is lesser known is the subtle but potent power of an exceptional sign. Exceptional signs can be simple or elaborate and still provide great visual appeal to passersby. One way to create exceptional sign and messaging is through post accessories. After all, sometimes it's the details that draw one's eye, that little extra finessed accoutrement that is the attention grabber. After all, why have drab when you can have grab! By adding something as simple as a wrought iron T-Strap to your wood sign, you can increase visibility and interest in not just the attractiveness of the sign but the message itself. We carry a wide variety of ready-made items in the post and panel sign hardware category. All are manufactured using the highest commercial grade metal and iron before adding a weather-resistant textured black powder coat finish. From several sizes of T-straps to Flat Straps, we can embellish a plain-looking wooden sign to perfection, without overstating it. Equally, wrought iron sign brackets and post collars further add to your sign's visual appeal. Just by incorporating these small touches, your sign will stand out from others near it. What's more, if you don't see the exact item, size or style you're looking for at Sign Bracket Store, we manufacture custom signage for customers too, including metal sign brackets and hardware. 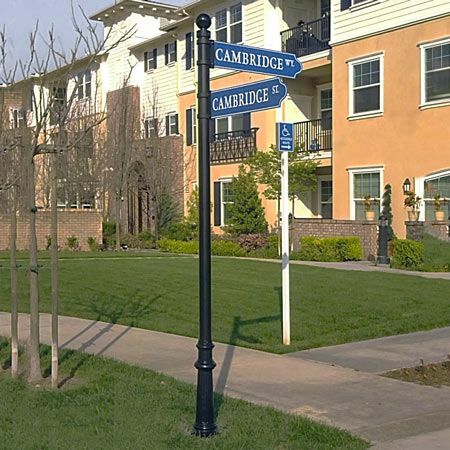 No matter which sign post accessories you select, we are here to help you enhance your sign messaging with either ready-made hardware that ships fast, or we can custom manufacture what you need. For additional information about post accessories, please call 888-919-7446 today.